Angela Davis (born January 26, 1944) is an American political activist, scholar, and author. Davis was most politically active during the late 1960s through the 1970s and was associated with the Communist Party USA, the Civil Rights Movement and the Black Panther Party. 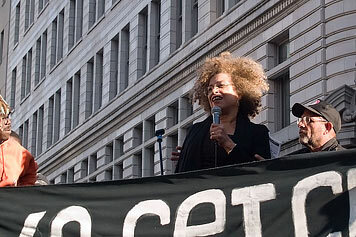 Prisoner rights have been among her continuing interests; she is the founder of "Critical Resistance", an organization working to abolish the "prison-industrial complex". She is a retired professor with the History of Consciousness Department at the University of California, Santa Cruz and is the former director of the university's Feminist Studies department. Her research interests are in feminism, African American studies, critical theory, Marxism, popular music and social consciousness, and the philosophy and history of punishment and prisons.